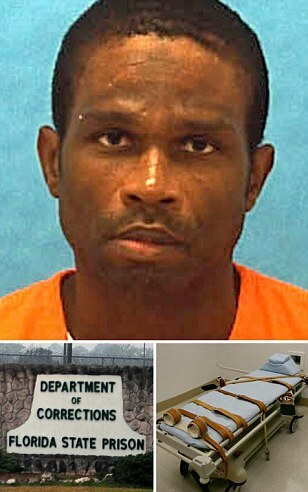 Chadwick Banks, 43, was put to death by lethal injection at Florida State Prison in Starke on Thursday night. He was pronounced dead at 7.27 pm. The Florida panhandle, who was charged with the 1992 slayings of his stepdaughter and wife, shooting both in the head, was served his last meal at 10 am. He requested fried fish, homemade French fries, hush puppies, old-fashioned dinner rolls and three desserts – homemade banana pudding, red velvet cake, butter pecan ice cream. To drink he asked for a glass of ice water. Banks’ attorneys had asked the federal courts to intervene in his execution, arguing Florida’s lethal injection process violates the ban on cruel and unusual punishment and that he received ineffective legal counsel, but had not been successful.